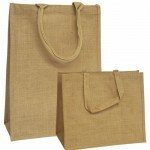 Natural lined jute bags with various handle types including self loop, padded, webbed, cane, rope and many more. Bespoke sizes and colours can be produced for you, minimum 1000 bags based on a 12-14 week lead time. Printed jute bags available from 50 bags printed with a simple single colour, multi coloured designs minimum 250 bags. Jute bags are an ideal choice as a bag for life. Small Natural Jute Bags With Rope Handles Price for 10 jute bags Jute bag siz..
Jute Bags With Padded Handles Bag size 410x180x340mm Price is per pack 10 bags ..
Small Wide Natural Jute Bags With Webbed Handles Price for 10 jute bags Ju..
Small Natural Jute Bags Price for 10 jute bags Jute bag size 250x100x280mm Ou..